I was a UX Design intern on the Universal Shopping Experience team at Amazon from January to June 2013. 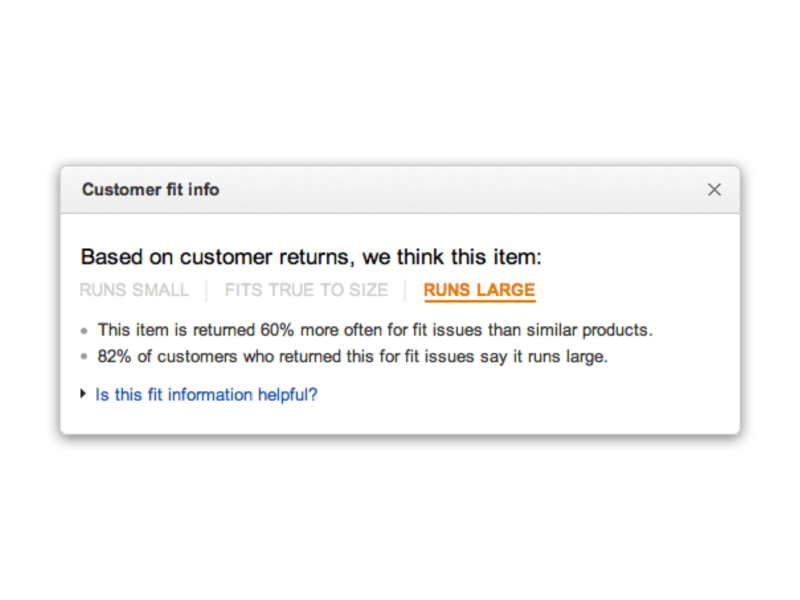 My first project was to help design a new feature for Customer Reviews that indicated to customers whether, on average, a clothing product was bigger or smaller than expected. We started with a lightweight approach of interpreting product return data (essentially, the reason codes “fit too large” or “fit too small” as a percentage of overall returns) and surfacing that data on the detail page when appropriate. “When appropriate” was the hardest part to get right. The goal of the feature was to lower the overall percentage of returns and help customers figure out whether an item is likely to fit them before trying it on. This was a great exercise in learning how to work with a product management team to deliver phased, incremental improvements to an idea.